In which The A.V. Club asks its favorite rockers, writers, comics, or whatevers to set their MP3 players to shuffle and comment on the first few tracks that come up—no cheating or skipping embarrassing tracks allowed. 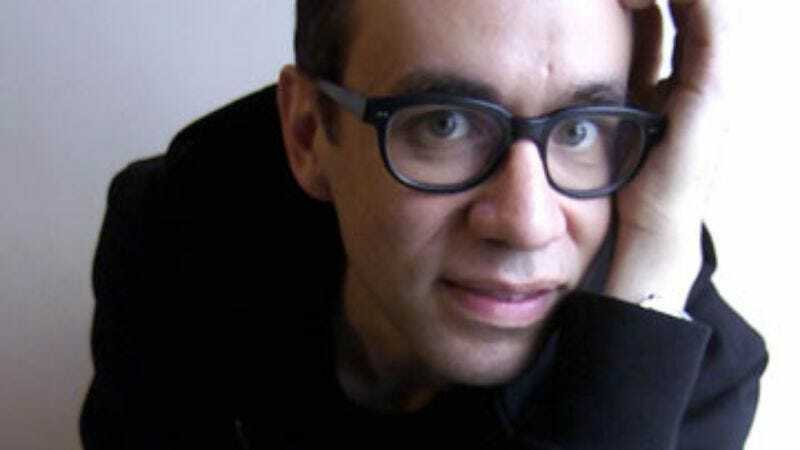 Shuffler: Comedian and SNL cast member Fred Armisen, who parlayed a career as an indie-rock drummer into a full-time comedy gig. In addition to playing Ferecito and Prince on Saturday Night Live, this year Armisen will hit the big screen with appearances in a handful of films, including the long-in-the-works Tenacious D movie. The Goon Show, "The Ghastly Experiments Of Dr. Hans Eidelberger"
Fred Armisen: This is something from The Goon Show. It's Peter Sellers and all these people. And they're pretty long. I'm going to be honest with you, I sometimes have to just fast-forward through it and go to the next song, because they're so long. I can't really sit on the train and listen to a half-hour of comedy. Sometimes it's really funny, and then sometimes I don't have the patience for it. It's nice to know how much stuff has not changed in the past 40 years, comedy-wise. Sometimes I think some ideas are so brand-new and crazy, and it turns out that they've been around for ages. FA: They were really good friends with [Armisen's band] Trenchmouth, and we toured with them a couple of times. For me, it's a nostalgic thing. Whenever I hear it, it brings back memories of hearing them live. They were great. They were experimental, but they still had percussive and 4/4 times, like regular songs. It wasn't like crazy-experimental, it was happy-experimental. FA: I remember really looking for this, because I heard it on the radio. It's aged really well. It's one of those few songs I can hear over and over on the radio. And it's still really heavy, and it's got emotion. Everything is synthesized except for, it sounds like, the drums. FA: It's the only Falco album I could find. It's a similar thing to "Cars" in that I think the song "Rock Me Amadeus" is really, really great. They're very similar. It's kind of cool that they came up next to each other. But the song "Jeanny," I barely remember it. "Jeanny" was sort of a pop song with some acoustic guitar, but I always immediately fast-forward through it. I just say, "Yay, Falco," and then I move on. There's also "Der Kommissar," which is really cool. You know, he died. You know the video for "Der Kommissar"? It's him running in front of a police car. And I've always wanted to copy that if I ever get to do a video for a band or something. TV On The Radio, "Young Liars"
FA: I think this might be my favorite of theirs, because it's the first one I heard. And then when I would read about them, they looked really great, and I liked their names, too. I think they're great, but unfortunately I've never had a chance to see them live. Sleater-Kinney, "Banned From The End Of The World"
FA: I just love Sleater-Kinney so much. Every time I hear them on my iPod, I always let the whole song play out. I remember when The Hot Rock came out, and I loved it so much. The A.V. Club: Do you ever feel the need to express yourself publicly because you're listening to this song on the train, or walking down the street, and it's so good? FA: No, I keep it very private. Not only do I keep it private, I can't deal with other people making their musical tastes known to everybody else. I don't like people bobbing their heads or getting into stuff at all. It should be private. And the headphones I use are those Bose noise-canceling ones. And I keep it really loud. I like to listen to everything really loud. I don't even tap my feet. I hate that. Keith Moon, "U.S. Radio Spot"
FA: I bought this on CD a little while ago; I used to have it as a record. It's really fun to listen to. It came out in the later part of Keith Moon's life, and it's more like a museum piece. "Radio Spot" is just him doing promo for it. He put out this solo album, and it sounds like he did it in L.A. There's all these L.A. people on it. And it's just him singing covers, pretty much. "In My Life" by The Beatles. And some Beach Boys, even a Who song. And Ringo's on it. And he does a lot of jokes with Ringo. I just like hearing Keith Moon's voice. He's my favorite drummer ever. Sometimes I had an image of him being a Cockney guy, like a London guy. And when I listen to this, I feel like he was pretending to be, but he sounds a little like a middle-class rich guy. I just like listening to him speak. He doesn't sound as crazy as all the photos. All the pictures of him are of him as this lunatic. This sounds more like he's a jokey guy who's a little more soft-spoken. Eminem, "Cleanin' Out My Closet"
FA: I think he's great. He does something I could never imagine doing—I can't imagine putting words together as well as that. That's a really good song. It's almost like he's so big that I can't really say anything about it. He's great. He's not like something I just downloaded, and I'm really excited, and I just want to listen to it all the time. It's more like, "Oh yeah, there's that Eminem song I put on a couple years ago."